If you have been seriously hurt in a motor vehicle accident, friends and family may be urging you to speak with a personal injury lawyer about your case. Some individuals avoid talking to an attorney because they are intimidated by the process, or they may worry that they can’t afford to hire legal representation. The truth of the matter is that there are several reasons why working with an attorney can be advantageous for your case, and in today’s post, we’ll review a few of the benefits of hiring a car accident lawyer. The Flanagan Personal Injury and Wrongful Death Law Firm is here to help Miami-area residents who have been injured in a car accident. In the weeks, months, and years following a motor vehicle accident, you deserve to work with an experienced injury lawyer who has your best interests in mind. Contact our law firm today to request your free case evaluation. Understanding the laws surrounding Florida personal injury cases is critical to obtaining the best possible outcome on your case. Personal injury attorneys are very knowledgeable in the various statutes of limitation that are applicable to your case, and they have in-depth experience navigating the complexities of properly filing all of the legal documentation pertaining to your case. In the absence of experienced legal counsel, you could run the risk of missing important deadlines related to your case, barring you from any type of recovery. Many injured individuals find this to be one of the biggest benefits of hiring a car accident lawyer. Moreover, it is almost guaranteed that the insurance company for the at-fault driver or at-fault party will treat you unfairly, make unreasonable and unfair settlement offers, not take your claim seriously, and otherwise try to take advantage of you because you are not represented by a lawyer. In fact, there are departments within insurance companies that specialize in contacting and meeting with seriously injured people following a tragic accident with the goal of coercing the injured person into an unreasonably low settlement before they hire an attorney. For example, some insurance carriers will send representatives to the hospital to see you and offer you a small amount, like $5,000 to help you “get back on your feet.” In exchange, they request that you sign a release settling any and all future claims. Unfortunately, this is effective and sometimes deprives people of fair compensation for their injuries. Without an experienced attorney, insurance companies will continue to try to take advantage of you throughout the claims process. Being in a motor vehicle accident is stressful enough. In addition to making your way to multiple doctor appointments, missing work, and struggling to get your life back together, the last thing you want to worry about is dealing with insurance companies and medical providers. The insurance company will want to speak with you right away, and they are likely to want a recorded statement if liability is in question. Medical providers may want to make you jump through hoops to get copies of treatment notes. A personal injury lawyer can act as an intermediary for you in your personal injury case. Once you sign a representation agreement, your attorney can begin working on your behalf to lessen your stress levels and help manage your case. When you file a personal injury case, you will be required to provide documentation to prove that you were injured. The bulk of this documentation will be in the form of medical bills and records. Your auto insurance company can request these items from the medical providers, but the Health Insurance Portability and Accountability Act of 1996 (HIPAA) has made it very challenging for anyone but the injured party to obtain this documentation. This can unnecessarily delay medical bill payment and reimbursement. When you have a personal injury lawyer working on your behalf, they will have a whole team of paralegals working with the medical providers and following up on a regular basis to obtain the records you need to prove your case. Personal Injury Protection (PIP). This coverage could afford you up to $10,000 of compensation regardless of who is at fault in the accident. Bodily Injury Coverage (BI). If the at-fault party has insurance, you can file a BI claim through their policy for your pain and suffering, permanent injury, loss of the capacity to enjoy life, lost wages, loss of earning capacity, inconvenience, mental and emotion distress, mental anguish, and disfigurement. Uninsured/Underinsured Motorist Coverage (UM/UIM). In the event that the at-fault party was uninsured or underinsured, you can file a claim through your own UM/UIM coverage for compensation for pain and suffering, permanent injury, loss of the capacity to enjoy life, lost wages, loss of earning capacity, inconvenience, mental and emotion distress, mental anguish, and disfigurement. Insurance companies defend car accident cases everyday. They have teams of lawyers that are assigned to handle the thousands of cases that are pending at any time. Usually, insurance company evaluate claims based upon what a projected jury verdict at trial might be. Without an attorney to represent you, the insurance companies will know that you have a very low chance of taking the case to trial and an even lower chance of success at trial against a team of experienced insurance defense lawyers. Therefore, they will view you as “not a threat” and they will likely never pay you a fair amount to settle your case. If you do not have a lawyer, you should seriously consider speaking with an experienced accident attorney. Michael T. Flanagan has the experience and knowledge needed to handle your injury case, helping reduce your stress and give you the best chance of receiving the compensation you deserve for your case. We will help you gather the medical bills, records, and other documentation needed to support your injury case, and we will guide you through the process of filing a PIP, BI, and/or UM/UIM claim with insurance. Our firm is committed to handling your injury case efficiently and with the attention it deserves. When you hire our injury law firm for legal representation, you’ll always have open and clear communication with your attorney. 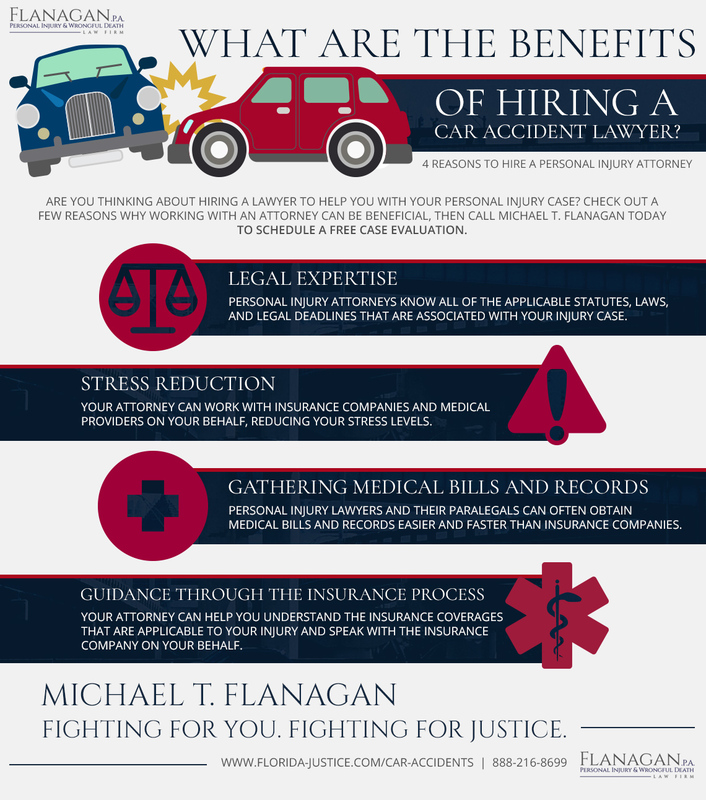 To learn more about the benefits of hiring a car accident lawyer, contact our firm today.